I mentioned on Thursday that I had replaced a picture of a bird at the last minute in order to post a picture of a rose that had been rained on. Here’s the picture that got bumped. 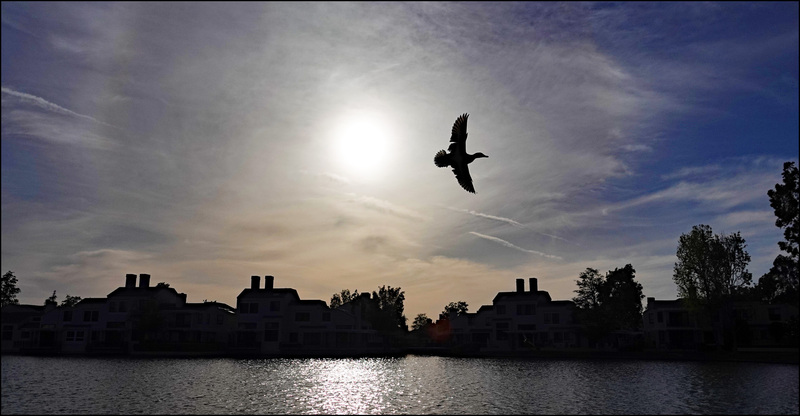 The bird itself is just a common duck, but I was lucky to catch it in flight near the sun an hour before sunset. Someday I’d like to get a picture like this of a flock of Canada geese, but that will require me to be at just the right place at just right time and then to snap the shutter at just the right moment. And it will require the autofocus to work perfectly. So far that hasn’t happened.